This case is from my friend Pierre Taboulet, who graciously allowed me to re-post it here. He has a fantastic EKG site for anyone who reads French, and also a great ECG book (written in French). He is a cardiologist who practices Emegency Medicine in Paris. What is the diagnosis? 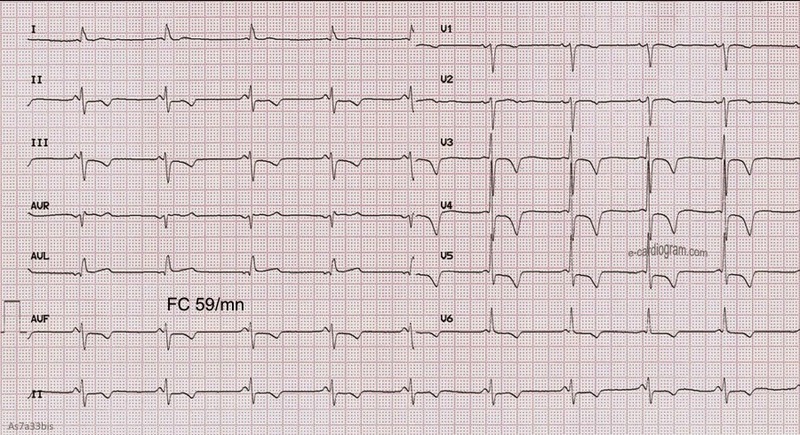 Hint: the T-wave inversions are co-incidental, nonspecific, and not related to the diagnosis. The image comes from this page. This is a translation of Pierre's interpretation: Sinus rhythm. AV conduction is abnormally short with a PR interval of 80 ms. As there is no visible pre-excitation (e.g., no delta waves). The short PR may be due to atrionodal fibers of James or to atrio-HIS fibers ("fibers of Brechenmacher"). This is otherwise known as Lown-Ganong-Levine syndrome. This anomaly does not lead to re-entry, but may be associated with it if there are dual AV nodal pathways, in which case episodes of SVT may be very fast. "Lown-Ganong-Levine (LGL) syndrome refers to a syndrome of short PR interval, narrow QRS (without pre-excitation), and episodes of palpitations or SVT. The mechanism of the short PR interval is uncertain, but is most likely due to faster AV nodal conduction, probably due to rapidly conducting fibers in the AV node. Alternatively, as indicated by Dr. Taboulet's interpretation above, there may also be atrial-HIS fibers known as Brechenmacher fibers that bypass the AV node. Although the syndrome requires palpitations or SVT, it is thought that the tachycardia associated with these fibers is not a result of them but rather due to re-entrant dysrhythmias. Both syndromes have been found in association with dual AV nodal pathways (which is the anatomic substrate of AV nodal re-entrant tachycardia - AVNRT) and also with concealed accessory pathways (which are distinct and separate from the fast nodal fibers and which is the substrate of AV reciprocating tachycardia - AVRT). Since a delta wave, by definition, precludes the diagnosis of LGL, only EAVNC has been seen with an overt (unconcealed) accessory pathway. The most common arrhythmias in these syndromes are re-entrant SVTs (intranodal or orthodromic through a bypass tract). However, the incidence of these arrhythmias is not clearly higher than it is in patients without these syndromes (my comment: and there seems to be no clear anatomic reason why they should be). On the other hand, atrial arrhythmias can result in very fast tachycardias in the presence of LGL or EAVNC, as they can be conducted to the ventricles much faster than through the AV node. Thus, atrial flutter or fibrillation, or atrial tachycardias, can have very fast ventricular rates (similar to atrial fibrillation with WPW), and can result in dangerous ventricular dysrhythmias. 1. Ward DE, Bexton R, Camm AJ. Characteristics of atrio-His conduction in the short PR interval, normal QRS complex syndrome. Evidence for enhanced slow-pathway conduction. Eur Heart J 1983; 4:882. 2. Gallagher JJ, Sealy WC, Kasell J, Wallace AG. Multiple accessory pathways in patients with the pre-excitation syndrome. Circulation 1976; 54:571. 3. Benditt DG, Epstein ML, Arentzen CE, et al. Enhanced atrioventricular conduction in patients without preexcitation syndrome: relationship to heart rate in paroxysmal reciprocating tachycardia. Circulation 1974; 65:1982. 4. Josephson ME, Kastor JA. Supraventricular tachycardia in Lown-Ganong-Levine syndrome: atrionodal versus intranodal reentry. Am J Cardiol 1977; 40:521. 5. Denes P, Wu D, Rosen KM. Demonstration of dual AV pathways in a patient with the Lown-Ganong-Levine syndrome. Chest 1974; 64:343. 6. Wiener I. Syndromes of Lown-Ganong-Levine and enhanced atrioventricular nodal conduction. Am J Cardiol 1983; 52:637. 7. Holmes DR Jr, Hartzler GO, Maloney JD. Concealed retrograde bypass tracts and enhanced atrioventricular nodal conduction. An unusual subset of patients with refractory paroxysmal supraventricular tachycardia. Am J Cardiol 1980; 45:1053. Given that impulses may be following an accessory pathway like the James Bundle, would adenosine be contraindicated in someone with this and A-fib like it is with WPW? And without the obvious changes like WPW causes (QRS/T wave changes), would it even be possible to recognize it with A-fib? I don't know. But I do know it would be very fast, and this would be your clue to using electricity, not a nodal blocker. Thank you for your ongoing brilliant work. Every person I talk to on ECG interpretation I refer to your site. On this ECG. I was wondering if an ischaemic cause to the palpitations was ruled out with the wide spread t inversion ST elevation in aVL and reciprocal inferior depression. I don't know from first hand experience, but Dr. Taboulet says the T inversions are from hypertension. And to me they appear to not be ischemic. Why? In my experience, ischemic T inversions either have an upsloping ST segment followed by T inversion, or have a downsloping ST segment followed by symmetric T wave inversion. In this case, they are asymmetric, with a more gradual downslope than upslope. This is an informal observation that I have not tested with hard data. "This does not apply to AVNRT because both limbs of the dual AV intranodal pathway are slow and you would need at least one to be fast in order to have a very fast loop." Did you mean both limbs are slow compared to the bypass tracts? Having two slow limbs in the AV node would be quite a rarity. Sorry for the late reply. Yes: compared to the bypass tract or to the greasy AV node tract.